Does My Dog Need Boots For The Snow? Do They Wear Dog Boots in the Iditarod? You might not be thinking about winter right now (depending where you live), but it won’t be long until chilly weather rolls around and you’ll be once again worrying about how to keep your furbabies snug and warm – both inside and outside the house! If you’ve ever seen a dog walking along with shoes on his paws, you’d probably think they look pretty darn cute. Some doggy shoes are made for hiking or rough terrain, but the type of dog booties or shoes I want to focus on in this guide are the style that are designed to keep paws warm first and foremost. If you live in an especially cold environment, dog foot warming shoes almost become a necessity when walking outdoors during the depths of winter. These dog shoes give you more confidence in taking your dog out walking during the coldest weather, without stressing about how their feet are coping in the conditions. Once you’ve decided that you definitely want to give dog booties a try (and some dogs will require patience to help them get used to the shoes), you’ll quickly find out that you have countless options. So which shoes are going to really help protect your dogs’ feet from the cold and potentially rough or slippery terrain? This guide is based on many hours of research that I’ve undertaken to help make your choice easier. I’ve spent considerable time finding out what hundreds and hundreds of dog owners are experiencing with the boots they’ve bought for their dogs to use specifically in cold weather (I will cover other types of doggy boots in other articles). And I’m not afraid to call out any products that are not up to scratch: if it’s not made well, or if it doesn’t do what it should, then I’m going to tell you why and what made me come to that conclusion. 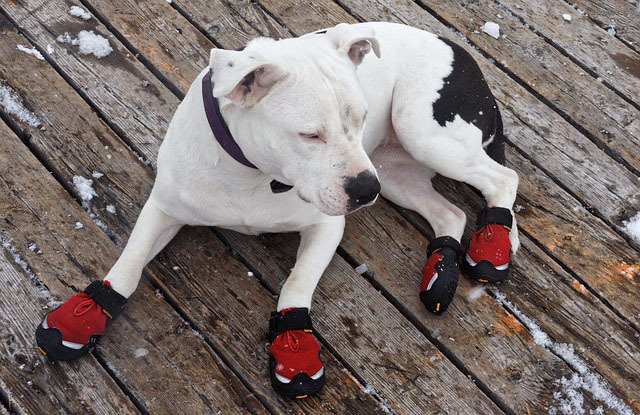 Do you even need to get shoes for your dog to walk in snow or icy conditions? It’s well known and proven that dog paws have an amazing adaptation to being able to withstand the cold of snow and ice, even without having their paws go frozen while walking on very cold terrain. This is because of the high amount of fat in the paws (ever noticed how soft and padded they feel? Hence, “paw pads”) and this fat is less prone to freezing than normal body tissue. And the blood flow to and from dog’s feet works very different to ours in cold weather, making them considerably more able to withstand all but the most extreme temperatures under their feet. So if dogs are so amazingly well adapted for walking on cold surfaces, why bother with shoes? Extra comfort – just like we enjoy warming them up with a jacket on a cold day, boots can give you that extra piece of mind. There’s another reason besides warmth though: that’s for added traction. The best dog shows will have a non-slip surface on the sole which can be highly beneficial in some environments and scenarios that you might find yourself in when out on a walk! 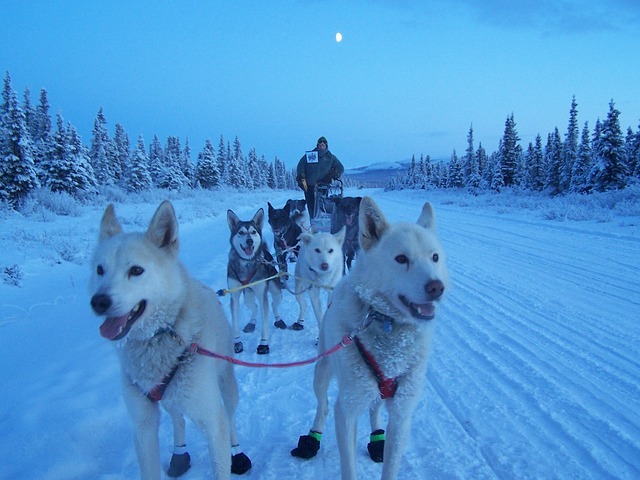 However you might feel about the famous long distance sled dog race Iditarod, it takes place in one of the coldest places in the world in Alaska. So what do the very cold-adapted Husky and Malamute dogs do there to cope with the extremely cold conditions they’re exposed to for long periods of time? While your dog is (presumably) never going to be put under such conditions, we can still look at the Iditarod dogs to gain some insight into what protections are in place for them when it comes to the cold. It is in fact mandatory for dog booties to be carried for every single dog participating in Iditarod. And it’s not just because of the cold. In fact that isn’t the main reason these dogs wear shoes at all. Heaving through the heavy snow as they do, one of the greater risks is a build up of snow between the toes and this is a big reason why dog booties are often used in the Iditarod dog sledding. So foot protection is the primary reason why Iditarod dogs wear boots or shoes, rather than for warmth. Because of the long distance and intensity of the sledding race there (again, this is a controversial topic amongst a lot of us dog owners so I’m keeping the focus purely on the subject at hand here rather than discuss the ethics of dog sledding races), Iditarod dog owners change the booties very regularly – but regular use of most good quality dog boots will result in them lasting a long time for most dog owners. First, let’s talk about what to look for when selecting special cold protection shoes for your beloved dog. If your shoes aren’t comfortable to walk around in, you will avoid wearing them. If your dog’s boots are giving her discomfort then she’s going to become irritated. This is the most important aspect to consider when you’re buying shoes especially to protect from cold weather. They need to be designed for warmth, and the best doggy winter shoes will have special features for this very purpose which makes them stand out from other types of dog shoes. Like our shoes, dog booties also need to fit well. Too tight and there goes their comfort, and too loose and you’ll be dealing with shoes that are falling off your dog’s feet. You want the shoes not to fall off and not to be tight – just right is what we’re aiming for. Every manufacturer (besides the cheap imitators who you’ll mostly want to steer clear of anyway) will provide a sizing chart or recommendation based on dog breed. These are generally very accurate and additionally, there’s room for error with most shoes being adjustable so you can make the final secure fit for each of your dog’s feet once you’ve got the boots on. Guide to Hiking With Your Dog + Best Dog Hiking Gear Reviews! Dental Food & Treats For Dogs – Which Are The Best for Dogs Teeth?